Classic Vintage Early American Aged Copper Star Five-Hook Quality Barn Star Scrolled Key Holder Measuring Spoon Hanger for home and kitchen. This attractive key holder is a household necessity to keep track of everyone's keys in our busy world today! The hanger is hand-scrolled and fabricated by skilled tinsmiths working to the highest quality standard. It features the new, exciting and popular Aged Copper Finish. Genuine copper is electrostatically deposited on the metal in a thick coat that will not chip or peel, and then is coated with a durable lacquer for years of daily use and enjoyment! Wonderfully scrolled with a stylish Barn Star, it is a nice added touch to any Rustic, Country, Early American, or Country French environment! Don't go one more day wondering where your keys are! It is small enough to fit wherever you want at 7.75 inches wide and 3.75 inches tall with hooks that extend 1.25 inches from the wall. This is a must for you, and a present that will be remembered every time your friend has his or her keys handy! 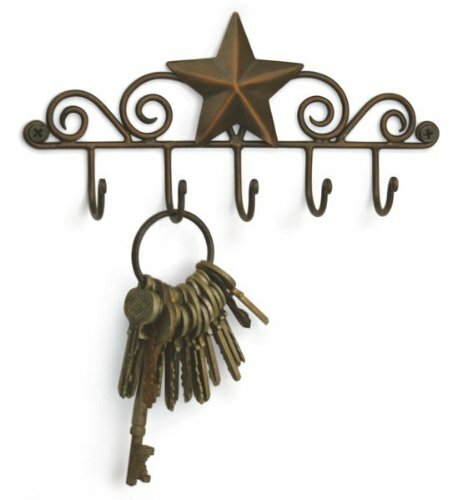 Five hooks for hanging keys and other essentials in ultimate star quality style!